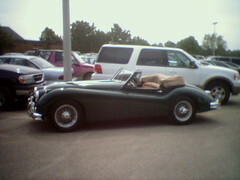 Today going to a meeting at school I saw a Jaguar XK140. I’d never seen a Jag that old before, and it was REALLY nice. You can see all the pics I took here. You can read more about the car here. I would have thought with a car that nice and old, that the driver would have at least parked it in an actual parking spot. But the driver parked the car illegally and on a sharp corner. Look at the line going under the car in one of the picture. But it is a very beautiful piece of machinery. Yeah, I did notice it wasn’t parked in a parking spot. 🙂 I kinda laughed, and wondered if it would get a ticket.